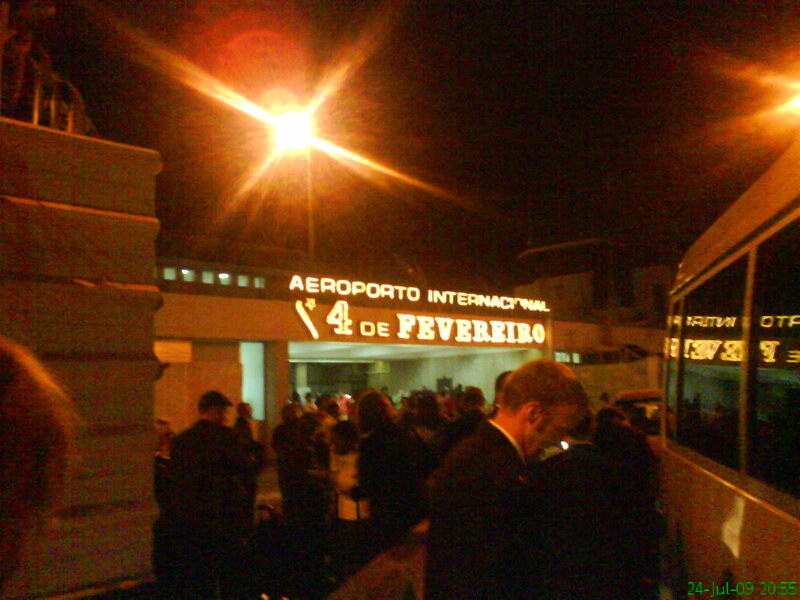 Quatro de Fevereiro International Airport (Portuguese: Aeroporto Quatro de Fevereiro or Aeroporto 4 de Fevereiro) (IATA: LAD, ICAO: FNLU) is located in Luanda, a city in the Luanda Province and the capital of Angola. Quatro de Fevereiro is Portuguese for February 4th, a national holiday in Angola marking the start of the armed struggle against the Portuguese colonial regime on 4 February 1961. The airport resides at an elevation of 243 feet (74 m) above mean sea level. It has two asphalt paved runways: 05/23 is 3,716 by 45 metres (12,192 × 148 ft) and 07/25 is 2,600 by 60 metres (8,530 × 197 ft). On 12 February 2000, a Transafrik cargo Boeing 727 crashed upon landing on runway 23. Due to high winds gusting to between 50 and 80 knots, the aircraft had executed a missed approach, and upon the landing flare of the second attempt, witnesses saw the right wing touch the ground. On May 25, 2003, a Boeing 727-223 with the registration number N844AA, which had been parked at the airport for over a year, was stolen in mysterious circumstances. On 27 June 2009, a British Airways Boeing 777-200ER G-RAES was damaged after a collision with another aircraft while it was parked. On 31 January 2010, Guicango Yakovlev Yak-40 D2-FES suffered the collapse of all landing gears on landing after a flight from Cabinda. CAUTION Lgtd oil derricks on and in vcnty of arpt.